Today we drive along Marmara sea cost and Dardanel. We have lunch at Gallipoli or Eceabat (Maydos) . The tour commence at the battlefield, first we drive along Brighton beach and we stop at beach cemetery where John Simpson Kirk Patrick burial. He became legendary man with his donkey. We take photo of Anzac cove and continue to drive to north beach, on the way back we stop at the Shapnel gully. The rest of afternoon we will be at lone pine, trenches, Quinn’s post, Neck. We finish tour at Chunuc bair and across the Dardanelles for our hotel. 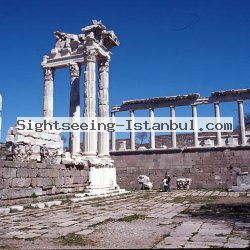 We leave from hotel early morning after short drive we visit legendary Troia and driving to Pergamum .After having lunch we visit ancient acropolis(Pergamum acropolis was rival acropolis of Athens in ancient times) and Asklepion which was famous medical center. We drive to Kusadası for overnight. Today we don’t have really very long drive but we will be very busy at ancient ruins of Ephesus. We visit ruins of third Ephesus, house of Virgin Mary and St. John Basilica (where Apostle John the Evangelist) at the end of the day we visit leather production center. Today we head to magnificent white calcium terraces, known as travertine’s, in Pamukkale where we also visit the ancient of Hierapolis, meaning sacred city was an ancient center for pagan cults until it was transformed into Christian center in the first century. The Apostle Philip lived and was martyred in Hierapolis, recently his grave has been founded. Overnight and dinner at hotel. We have really long to drive today, therefore we leave from hotel very early morning, on the way we visit Konya in the ancient time city was known as Iconium. We take photo of Inceminareli medrese and Aladdin hill. Aladdin hill where was ancient city, and surround with wall. By main entrance of city Greek hero Perseus holding a gorgon head where city got its name ‘image’ meaning İcon. We visit also the base of whirling dervishes and drive to Cappadocia, dinner and over night at hotel. We start the day with a visit Göreme open air museum, the most famous tourist attraction At the Cappadocia. A complex consisting of ancient cave churches and monasteries cut into rock by monks. Those churches are decorated with beautiful frescos. We visit Paşa bagı, Uchisar, Pigeon valley, Ortahisar. We will go back to hotel with nice memories.